Hello, my name is Abraham Ohrenstein. I was born and raised here in Sarasota. I first became interested in the Martial Arts as a kid when my family would spend summers in NY. There was a local Dojo that I trained at for four summers, and I really enjoyed it. During my high school years we stayed in Florida. After graduating from the Booker VPA music program, I had a lot more time on my hands. 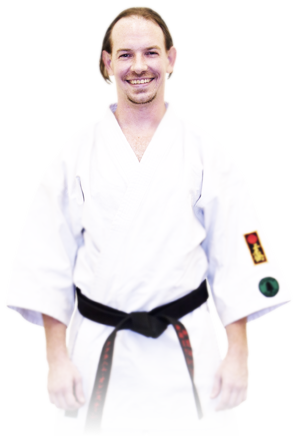 I wanted to train again in the Martial Arts and started training privately with a Tae Kwon Do instructor for about 6 months. I enjoyed the lessons, but I really wanted to join another dojo and train again in a class. I started asking around to see what was available in Sarasota, and both my neighbor and a family friend told me about West Coast Martial Arts Academy. They said they’d been to places all over, and WCMAA is the best. I called the Academy and made an appointment to go down there and see what it was like. It was my 19th birthday the day I arrived to sit in and watch classes. I sat and watched both the Karate and Jiu Jitsu classes for an hour each since I was interested in seeing what the school had to offer. I was blown away after it was all over. Shortly after class, one of the instructors asked me which of the two Arts I’d like to sign up for; I told the instructor “both”. About four years later I received my Shodan for Karate in Dec. 2003, then for Jiu Jitsu in Jan. 2004; only five weeks apart, and I haven’t looked back. Over the years since, I have continued to learn and gain knowledge in the Arts. I truly feel blessed and fortunate to be able to train and teach at the academy for so many years. I have met many wonderful people, and I’ve made so many incredible friendships along the way that couldn’t have happened anywhere else. I can honestly say the Martial Arts have shaped who I am today as a person, and have given me the tools, confidence, and knowledge to be successful at life.